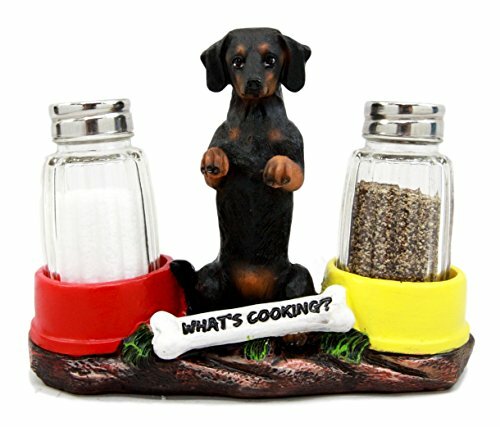 This Dachshund salt pepper shaker set is made of high quality polyresin, hand painted and polished. They are equipped with two glass shakers as pictured without the condiments. This Dachshund salt pepper shaker set measures approximately 5" tall, 6.25" wide and 3" deep each. Add some flair to your kitchen and dining setup with this awesome salt pepper shaker set. This cute Dachshund dog figurine resembles our very own pet! Famously nicknamed the sausage dog, he is a very stubborn hunting dog and he has a knack to chase small animals around. He is featured in this showcase in the black and tan short hair coat breed. This Dachshund salt pepper shaker set is made of high quality polyresin, hand painted and polished. They are equipped with two glass shakers as pictured without the condiments. This Dachshund salt pepper shaker set measures approximately 5" tall, 6.25" wide and 3" deep each. This cute Dachshund dog figurine resembles our very own pet! Famously nicknamed the sausage dog, he is a very stubborn hunting dog and he has a knack to chase small animals around. He is featured in this showcase in the black and tan short hair coat breed.